Traditional conservatives are having a tough time with the Trump administration, as the Republican party elected a leader who doesn’t seem to hold much ideological loyalty to their cause. Whether Donald Trump really has the traditional interests of conservatism at heart is up for debate, but one victory they can claim is the appointment of Neil Gorsuch to the Supreme Court after Obama’s appointment was stonewalled. They may not manage to repeal Obamacare or cut taxes on the wealthy to punish the poor, but Supreme Court appointments are for life. That was one of the messages at this weekend’s Federalist Society conference, an annual Washington gathering where think tanks, academics and business leaders gather to push their policies forward. 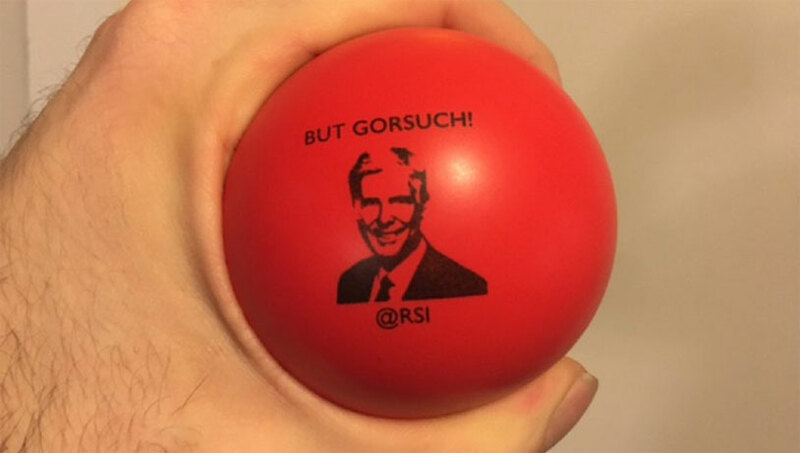 The R Street Institute, a D.C. think tank, distributed “But Gorsuch” red stress balls to attendees, so if they got too upset about the myriad bungles of their administration they could cool off with at least one good thing. One R Street Institute rep even tried to get a ball to Gorsuch himself during the dinner at the event. The Justice spoke to the assembled crowd about how he would honor and perpetuate the late Justice Anton Scalia’s strict Constitutionalist viewpoint in cases he heard.